Our large Spray Equipment Department carries dozens of pumps and spray guns as well as hundreds of parts in stock. For Airless and turbine HVLP equipment, we primarily sell Spray-Tech brand--in fact we are your approved warranty center for Spray-Tech. We also repair Graco, Titan, Hero, and Binks. 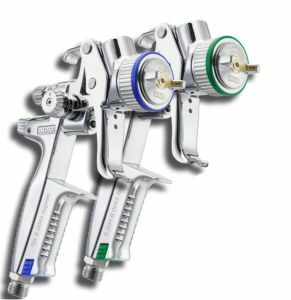 Knight's sells a full compliment of conventional airspray guns also, including Sata, DeVilbiss, Sharpe, Binks, Accuspray and Iwata Spray equipment.